Are you currently having issues with your digestion, or just not sure whether it is at its best? Many of us with digestive issues focus primarily on food as the main culprit. However, studies show that in many cases, posture can also be to blame. Poor posture has been proven to cause a number of digestion issues ranging from carbohydrate intolerance, such as “Fermentable Oligosaccharides, Disaccharides, Monosaccharides, And Polyols” intolerance (FODMAPs) to Irritable Bowel Syndrome (IBS) and bloat. It is not just what we eat but how we sit that impacts our bodies’ processing of food. According to current research, practicing the best posture for digestion can give sufferers relief from problems like gas, constipation and even mild abdominal pain. Understanding the connection between the spine and the digestive organs, as well as the best posture for digestion should, therefore, be in your interest as it can provide relief for these issues and much more. 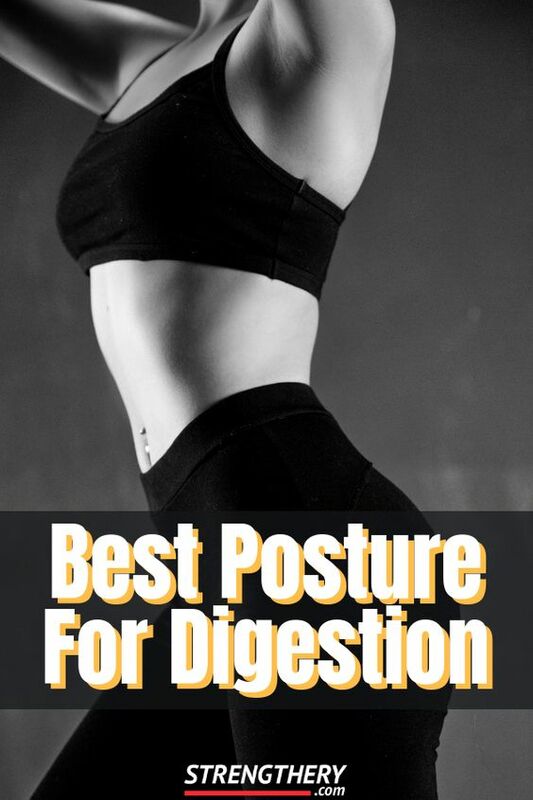 In this article, you will learn just that and I will also share some exercises that promote both healthy posture and digestion. How Does Posture Help Digestion? This is going to be a little bit technical explanation, but I will use easy to understand analogies as much as I can. The body depends on a series of muscular contractions and relaxations called “peristalsis” to move food along our digestive system. To visualize this, imagine slowly squeezing out the last bit of toothpaste from the tube with your fingers. This is a vital digestive function and if disrupted things can get ugly. In general, hunching over compresses the space in your lower abdominal area and the organs involved in digestion now have less space potentially disrupting the free flow. To go back to the toothpaste analogy, imagine someone pressing down your hands while you try to squeeze the tube. That is not going to help very much, right? If food is not moving freely or even stuck somewhere in the intestines, it can quickly affect the whole digestive system. It is, after all, like a long one-way street where things are meant to pass freely all the time. Excess gas is created, you feel constipated and you can even get heartburn (GERD). The thoracic diaphragm is one of those extremely important muscles, that you probably never heard about. It is the main muscle for breathing, but it is also a significant support for the peristaltic movements needed for digestion. You can think about the expansion and contractions of the chest cavity as helping to massage the food down through the digestion system. The diaphragm also works as a blockade for stomach acid, so if the diaphragm is under excess tension such as prolonged hunching over due to bad posture, the digestion can potentially suffer and you might also experience acid reflux. Prolonged excess stress on the diaphragm can even lead to chest pain in bad cases. Another accumulating negative effect is that a dysfunctional diaphragm might affect some of the nerve signals to the brain that controls the production of stomach acid. Stomach acid is needed to break down food for us to properly absorb it, and having too much or too little can make the problems even worse. E.g. with too little stomach acid bigger pieces of food enters the intestines slowing everything down even more. Having too much might create more heartburn. As I am sure you can understand now, giving the diaphragm and other parts of the digestive system a good amount of space by not slouching all the time is a very good idea! You can read more about having a healthy diaphragm on healthline.com. So, Which Posture Do I Need For Good Digestion? The posture you need for good digestion is not complicated at all, I bet you can almost guess it right away. You need a posture in which the diaphragm is activated and given space, and the core abdominal muscles are engaged. To achieve this, the first step is to breathe deeply from the stomach. People with a poor slouching posture often breath more from the upper chest than in the deep stomach which depends more on weaker secondary muscles instead of a diaphragm. This breathing pattern in combination with a hunched over posture can also prevent several muscles in the upper body from functioning properly and cause tightness that can worsen poor postures like rounded shoulders and forward head posture. In other words, changing breathing patterns can assist with digestion and help reverse poor posture. You can read more about good breathing patterns here. Position yourself forwards towards the edge of your chair. Make sure that your spine is directly above the pelvic bowl and that you are not tilting back or forward. Elongate the spine out from the bottom of the pelvis as though it is being pulled upwards with a string. Allow the head to float on the tip of your spine. Try not to sink into your shoulders or jut out your chin. Maintain a 90-degree angle at your hips, knees, and ankles. Instead of moving your head down to the food, be mindful to bring it up to the mouth. It is probably going to be difficult for you to abide by these guidelines right away and it could even be uncomfortable or painful as you are lacking the strength. But speaking from personal experience I can say that it does not take too long to get used to. The key is slow and steady progress. Of course, doing some additional exercise is going to speed things up. I am a big fan of both weight training and yoga, and both can be helpful. But in this case, I think yoga is going to be especially helpful! If you are interested in learning more about what causes poor posture in the first place, then you can check out this article on rounded shoulders. Improve “postural awareness” – in order to get good posture you need to familiar with what it looks and feels like. Reverse the effects that maintaining poor posture have had by stretching shortened and tight muscles and strengthen elongated and weak muscles. You can check out some exercises here. A lot of people find that products known as posture correctors are helpful in changing their posture for the better. If that sounds interesting to you, then you can check out some of the best products on the market here. Start focusing on these things today, and you will experience slow but steady improvements. What To Do When Correcting Posture Causes Pain?